girlgerms 26/05/2016 29/11/2018 12 Comments on How to: send an email when a server reboots…including who and why! So, I was told that this might make a good blog post, so thought I’d be a good person and share (because that’s the kind of person I am). A bit of background: If you follow me on Twitter (and you totally should), over the last few days you may have seen me wearing my ranty pants due to some issues at work. Specifically, regarding a coworker rebooting production domain controllers during the middle of the day with no warning. No IM to the rest of the team to let us know. No email to inform us. Nothing. Now, I can hear what you want to yell at me: “But if you’ve got your domain set up properly, it shouldn’t be an issue! With multiple domain controllers, there’s redundancy!” You’d be partially right. There is redundancy for the domain. But not for the apps that connect to the domain…and prefer to speak to a specific server (e.g. for LDAP binds). For the sake of getting past this, let’s say that in my environment I know what I’m talking about and rebooting a DC without any warning is bad juju…forgetting, for a moment, that rebooting any production server during business hours without warning is bad juju. So, moving on. Because this particular coworker, even after being told to let people know, went and did the same thing again the following day – I decided that action needed to be taken. We needed something that would tell us when these servers were going down – sure, monitoring helps, but if the server goes down and comes back up so quickly that your monitoring doesn’t catch it, it makes it hard. So I went hunting for something that would do what I was after…and I was able to find something that was close, and then kind of smooshed it into what I needed it to do. This is a fairly basic script, that I pared down from this one, from when I went hunting. The comments really tell the story – it gets the last EventiD 1074 entry in the System event log, parses that and turns it into individual variables. You put in your email address for To/From, punch in an SMTP server, and it spits out an email with the details of the EventID 1074. Pretty simple. The following is the script I used. You can also download it here. # Look for the last event with EventID 1074 in the System log. $Subject = $env:COMPUTERNAME + " has Rebooted"
#My Email body contains custom properties that will differ from your system. $Body = "$env:COMPUTERNAME has rebooted at $($rv.Date) by $($rv.User) `r`nReason: $($rv.Reason) ($($rv.ReasonCode)) `r`nComment:$($rv.Comment) "
The following is the XML for the scheduled task, or you can download the .xml file here. So that’s it – how to make sure you get an email when a critical server reboots and get the information you need to work out who and why! GirlGerms online > Documentation > How to: send an email when a server reboots…including who and why! Do DC’s need to be rebooted frequently in your environment??? They get rebooted monthly (for patching) and if there’s been issues with updates, then most definitely. Other than that, not really. Which is why we need to know when it is happening – because it can have major repercussions for other services. You can load balance LDAP requests on port 636, it works really well. As I said in the post, just trust me when I said that there are certain applications in my organisation that don’t play nice with multiple DNS servers. While you can point these apps at the domain for DNS, they’ll find one DNS server and stick with it…and no move on to another when the one it’s pointing to goes down. It’s much easier to point it at one AD DNS server and know which DNS server it’s pointing to, for service continuity etc. etc. Stephan is talking about putting a software load balance like HAProxy in front of your AD servers. I use HAProxy w/ Keepalived to to have redundant load balancers holding a single virtual IP. This allows services that LDAP bind (email spam filter, PHP web applications, etc) to always be assigned that IP address. HAProxy will do health checks against the servers to know which ones are up or down and appropriately forward the request. I like it! Does the 1074 event get thrown at any point in the event of power loss? I’d imagine not, yeah? I haven’t tested that out yet (certainly something to try!) but I would imagine it probably would, but it would be a System “unexpected shutdown”. Event ID 1074: “The process X has initiated the restart / shutdown of computer on behalf of user Y for the following reason: Z.” Indicates that an application or a user initiated a restart or shutdown. 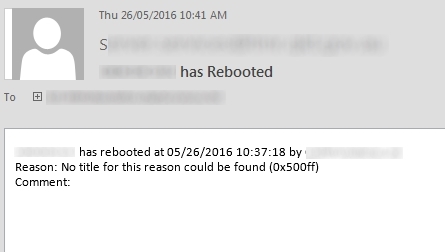 Event ID 1076: “The reason supplied by user X for the last unexpected shutdown of this computer is: Y.” Records when the first user with shutdown privileges logs on to the computer after an unexpected restart or shutdown and supplies a reason for the occurrence. Hi Jess, we had similar event based alerting with our 2008R2 DCs which stopped working after migrating to 2012R2. Does this work with your 2012 R2 DCs? Absolutely – this was actually set up purely on Server 2012 R2 DC’s. Sweet! I’ll give it a try. Good session at Ignite last week. On point.